ITS ORIGINS: The Brandy Milk Punch is a 19th-century cocktail popular in New Orleans, where many bars serve their own signature versions at brunch. The reason why is obvious. "New Orleans knows a thing or two about hangovers," says Adkins. ITS HEALING POWERS: Adkins drank his first Brandy Milk Punch nearly six years ago while visiting New Orleans for the five-day drinks and spirits festival, Tales of the Cocktail. "When you're in a place where the bars don't close, you can really hurt yourself," he explains. "I hurt myself so badly that trip that I honestly can't remember where I had my first Brandy Milk Punch." The creamy punch consists of milk, brandy, rum and simple syrup; it's served cold, much like eggnog. Adkins likes it because he claims that hangovers turn his stomach into that of an infant's. And what settles a newborn's tummy better than anything else? Milk, of course. "I can't go for something acidic like a Bloody Mary with tomato juice," he says. "All of those spices are too rough on my stomach. 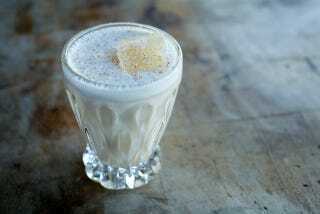 The milk in a Brandy Milk Punch, however, soothes my stomach." Adkins orders the punch for breakfast whenever he's had a rough night or whenever he sees anyone at Hard Water who looks like they feel similarly. "When they come in with that green hue, I make them a Brandy Milk Punch," he says. "It's perfect for the hungover, the drunk and the truly invalid." THE METHOD: Combine the brandy, rum, milk and simple syrup in a cocktail shaker. Shake until frothy. Strain into an old-fashioned glass filled with ice. Garnish with grated nutmeg.